I think, J. krishnamurti is one of those very few masters who care so deeply for humanity. J. Krishnamurti is the peak of sincerity. It is often said that J. krishnamurti writes very complex. It is always told that you will end up having frustration if you go on reading him. These are all immature comments. J. Krishnamurti when talks to laymen, he talks very simply. I would say as simply as Osho. His descriptions of nature and human behavior have intrinsic beauty and rhythm which any poet will strive to attain. The most important and striking point about J. Krishnamurti is he thinks at the same time for individual and also for the whole life on earth. Most of the mystics always point out that one should always think for oneself first and then for the society. It is true. When you see light yourself only then you can lead others towards light. So, almost all the mystics try an individual to cut away from the society and look for himself. Many of them advice to go in seclusion and contemplate. J. Krishnamurti is among those very few mystics who approach this problem on both the levels- individual and social. Many persons used to visit him. Many of these had political interests and many of them were social reformers. J. Krishnamurti always used to say if you are doing all this for the benefits of your self, your ego, you will end up in misery. He would even say that such social reforms will only give birth to more reforms and in continuity, will make the situation even worse. J. Krishnamurti was easily accessible to all - from poor to rich, from young students to old fellows. He used to make the most honest effort to show individuals how they are again becoming victims of their fragmented minds. He was very patient with all of these people. Many a times, his questioners were poor villagers, illiterate, uneducated fellows. He never tried to just give them some difficult answer and cut them away. He would go with their pace. Many times, his questioners would say that they were not able to understand what he said. J. Krishnamurti would not leave them so. He used to go even slower, simplifying his language till the questioner understood. One more point to note is, he used to talk to people of all backgrounds - from scientists like David Bohm to small kids of different schools and cities. While putting forward his point, he never hurt anyone, never hurt anyone’s feelings. Though his points were very true, genuine, showing fragmented nature of thought which everyone has, he never bluntly hurt anyone. He said it so truthfully and with so much affection that the questioner would understand that fact without hurting himself. One more blame which people accuse J. Krishnamurti of is that he was a dry man having lost all of his interests. I, along with other also thought on similar lines. But when I started reading J. Krishnamurti, I in moments came to know how false this blame is. 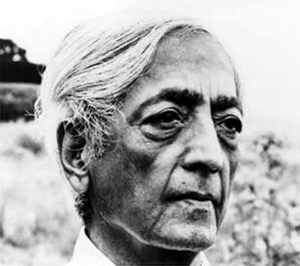 J. Krishnamurti was a lover of all sorts of arts. He had a deep understanding of beauty. Descriptions of nature and humans written by him at Rajghat and other places are highest level of poetry. In these descriptions he made, one can easily see the totality of his being. He used to go for a walk, would mix in common people, would chat with students and teachers, would sit observing rivers and nature. All this has a beauty which can be felt when you read J. Krishnamurti. All this shows his genuine concern, his sincere efforts, his sincere affection not only for humans but for everything that is really makes him most perfect for today’s times. This is the time that more and more people, especially students turn to his writings, his dialogues, discussions and all. The life today is full of self centered activities which finally bring misery. I can see J. Krishnamurti standing very close to me holding cup of bliss for all in his hands. Every time I read him or watch one of his talks I can't stop crying. Most beautiful person I have ever seen. Almost not of this planet. To think that a man of such wisdom and love has walked this earth and nothing really changes, it's a crying shame.